No. Currently, there is only one state, New Jersey, that has even proposed such legislation. Unlike normal spring-filled mattresses, pressure relieving mattresses have multiple layers of foam padding or alternating air pressure reduce the amount of pressure and friction put on bony parts of the body prone that are prone skin break-drown and ultimately development of bedsores (also referred to as: pressure sores, pressure ulcers or decubitus ulcers). 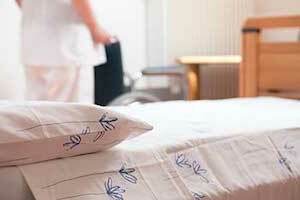 Under the terms of Bill S-1517, nursing home operators would have to switch from regular mattresses to pressure-relief mattresses within three years. Nursing home owners would have one year from the bills enactment to begin phasing in the use of pressure relieving mattresses. If this law proves effective in New Jersey, it will be interesting to see if other states, or even Medicare, passes similar legislation.